Our Custom Guidons & Burgees are made to impress everyone at first sight! 100% made in USA , these flags make a classic way to cheer on a local team, military parades, event or rally and can even be used on boats and marinas. 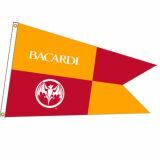 Customize it with slogans, mascot, brand or message and these flags that are offered in both single-reverse or double-sidedwillget your message across in style. Shop from our collection of Custom Guidons & Burgees and avail the best prices, quick shipping and much more! 100% customer satisfaction guaranteed! TuffFlags have a range of Custom Guidons & Burgees that can be customized in various colors. Light enough to fly and strong enough to take the beating of outdoor weather, these custom guidons and burgees made of 200-denier DuPont Solar Max nylon and finished with heading and grommets will make an eye catching spectacle. 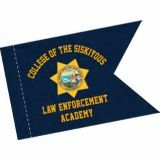 Apart from being durable advertisements, our 100% made in USA custom guidons and burgees also make well treasured keepsakes as well.Your design is appliqued/embroidered on these guidons depending on the size and details of the design. If you don’t have a custom design in hand, our team will help you get a perfect custom flag to match your needs. Custom burgees are used mostly by Yacht Clubs. Members can display these during the day or night,either when they areunder way orat anchorto highlight their identity and club’s name. 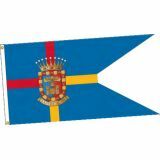 Browse our collection of Custom Guidons & Burgees and shop at the best rates. Should you need any tips or shopping assistance, call us at our toll free number (888) 872-3524 or email us at customercare@tuffflags.com and we can assist you.